Here I am in Paris, sitting on top of the concert hall where the trio made its Paris debut this week in a concert broadcast live by Radio France Musique. 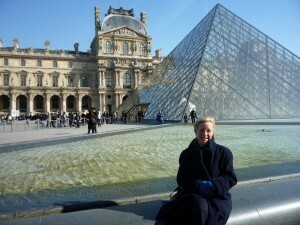 I’m sitting by IM Pei’s celebrated glass pyramid in the courtyard of the Musée du Louvre. Underneath the pyramid is a complex of foyers and lecture spaces including the ‘Auditorium du Louvre’ where we played. Strange to think that it’s taken this long to be invited to play in Paris, which is now only 2 hours and 20 minutes away from London by train, yet is separated from London by more than the English Channel. We found the Paris audience delightfully warm-hearted, and hope to meet them again soon. This entry was posted on Sunday 14th March 2010 at 9:56am	and is filed under Concerts, Florestan Trio, Travel. You can leave a response, or trackback from your own site. I see from the venue site that played the first Mendelssohn Trio in D minor, Op 49. According to Mendelssohn’s biographer, Larry Todd, at a performance of this trio in London in 1844 with the composer at the piano, the violinist, Heinrich Ernst, missed a page turn. So Mendelssohn improvised some piano flourishes until Ernst had found his place again. This led a banker in the audience to proclaim, there were more notes in “circulation than allowed by printed authority”.